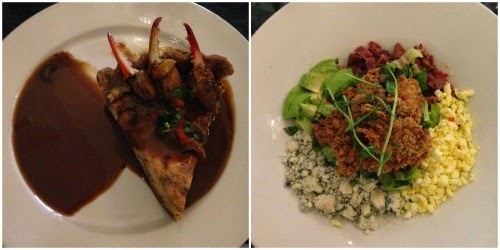 La vie Jaime : New Orleans Eats! I thought I'd kick off a couple posts on my weekend in New Orleans with the highlight: all that food! After watching Top Chef New Orleans a couple years ago, I was dying to get to some of the spots mentioned and try what NOLA is famous for: po' boys, beignets, gumbo... basically anything Cajun/Creole. I researched spots for dinner reservations mostly through "where to eat in New Orleans" and Yelp. Our first meal, Saturday lunch, was in Jackson Square at Muriel's. 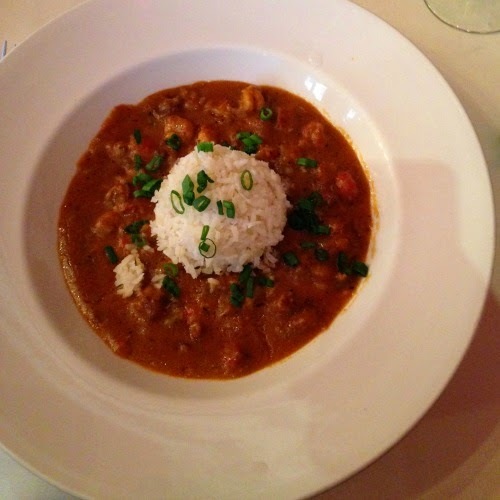 I dove right in with New Orleans eats and had crawfish etouffee. I had never had crawfish before and liked it! The rice took on all the spices and flavor of the sauce. 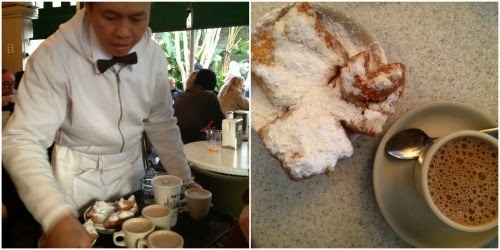 Our "afternoon snack" was beignets and coffee at Cafe Du Monde, of course! It was a delicious treat to hold us over 'til a later dinner. The beignet was the perfect mix of doughy, sugary flavor with a crunch. 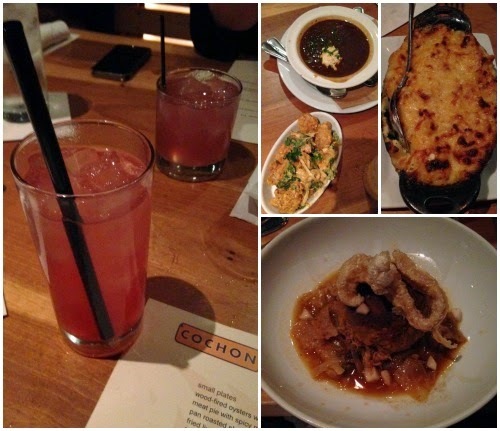 Dinner Saturday night was at Cochon. This was top on my list to visit after reading many positive reviews. I did not want to miss a restaurant named "pig" (in French). First off, the drink menu was very inventive. I had the "mollywop" (foreground drink) and my friend had the "hey, jack" (background drink). Mine tasted like a watered down Jolly Rancher (in a good way, ha!) and hers was margarita-like with a kick. Our appetizers were fried gator bites with chili garlic mayonnaise and seafood gumbo with shrimp deviled egg. I also had never had gator before. It was chewier than I expected; the mayo sauce was delicious, and I probably would eat anything doused in it. The gumbo flavor was bold and sort of dwarfed the deviled egg, but it was delicious none-the-less. I had their signature dish, Louisiana cochon with turnips, cabbage & cracklins. The pork was prepared like a crab cake and was amazing. I wish I could have finished it all! A side of shared mac & cheese (so cheesy) rounded out my entree. Not pictured and worth noting if you like chocolate and coconut was their German chocolate cake. Sunday kicked off with jazz brunch at Arnaud's in the French Quarter. It's a 4-course, prix fixed menu with prices ranging from $30-$40. My favorite parts of the meal were the beginning and the end. 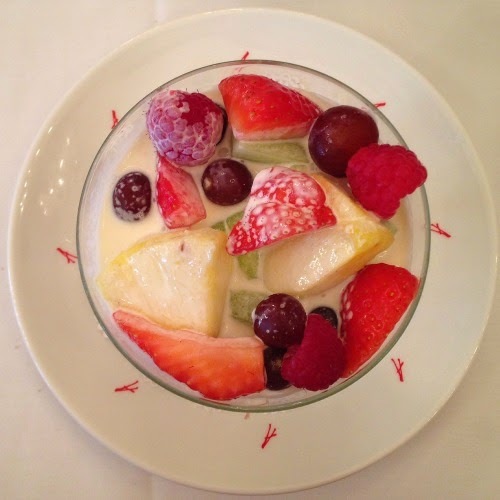 I started with the creole cream cheese Evangeline which was fresh fruit in a light, creamy sauce. It was such a pretty dish and the sauce didn't overwhelm the fruit. In the middle was a salad and the eggs Adrienne (eggs Benedict with sausage & creole sauce). The Adrienne Benedict was very good (no picture as it wasn't that pretty looking), and I mixed sauces with the creole and a classic hollandaise. Dessert was a NOLA classic, bananas foster made table-side. Click for a time-lapse video! The caramelized rum, brown sugar, cinnamon, and butter sauce was unreal. 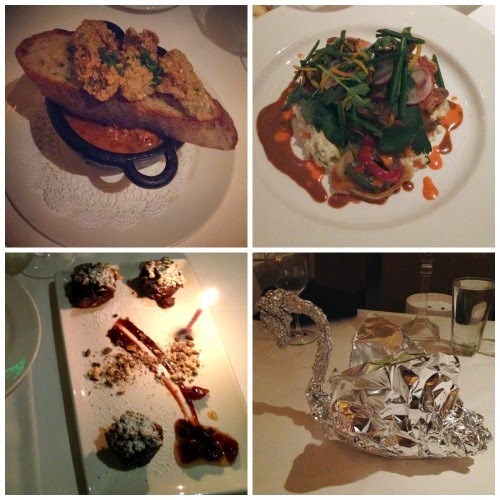 Our last dinner, Sunday night, was at Commander's Palace that was high on my list after the Top Chef episode there. It's been around since 1880 and most recently, Executive Chef Tory McPhail, won the 2013 James Beard award for Best Chef, South. It was fun to get all dressed up for this meal too and the service/experience did not disappoint. My favorite dish the entire trip was our appetizer here, Louisiana oyster fondue. You dip the crisp oysters in a sauce of goodness (brie, grilled kale, sundries tomatoes, bacon, and more goodness). SO GOOD. My meal was also delicious, shrimp & grits. For dessert, we had their famous bread pudding souffle and chocolate cherry beignets. Even though souffle is their signature dish, I much preferred the beignets (chocolate, Nutella, and dark cherry, yes please). They wrap their leftovers in a "swan-bag" - so cute! Finally, Monday, we sent ourselves off proper with a big lunch at Palace Cafe near our hotel. I had the crab meat cheesecake that totally intrigued me: crab meat, pecan crust, wild mushrooms, creole sauce. It was very good, lighter than I expected and the sauce was unreal (they really know how to do sauces in NOLA). For my entree, I had a Cobb salad with fried oysters. The oysters were the perfect light fry and there was a house-made sausage too. Needless to say I didn't need dinner that night. Well, that was a lot! Thanks for reading if you made it to the end! We really left no food stone unturned, and I was very happy with our choices. A few other spots on my list that we missed, like Coquette and La Petite Grocery, will wait till next time! New Orleans cuisine is so unique and these all look like divine meals! I would definitely like to try Cochon and Commander's Palace when I'm there. Mmm. Thanks for sharing! nola has some of the best food i've ever tasted in this world. so, so good. you hit all the spots i'd recommend. what a serious food recap! nice work.